Video games are an expensive habit. 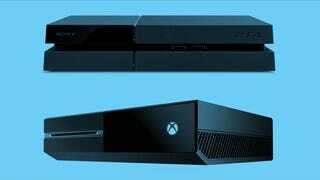 And few things are pricier than being an early adopter for a next-gen console like the PlayStation 4 or Xbox One. So if you're really itching to dive into some quality PS4 or Xbox One games, are you better off renting one system or the other and paying it off in installments? Rob Cockerman of Cockeyed.com fame put this theory to the test recently. His results were dispiriting, to say the least. For anyone thinking about getting a PS4 or Xbox One through a lease-to-own plan, just consider these numbers. At his local Rent-a-Center, a PS4 runs $35 for a week, or $70 every two weeks, meaning that one could pay off the whole system in 53 weeks. The Xbox One, meanwhile, runs at the same price but takes a bit longer to pay off since the system is slightly more expensive to begin with so it takes 58 weeks. All in all, he calculated that actually trying to pay off a PS4 or Xbox One through Rent-a-Center would run a gamer $1,854.47 or $2,029.42 respectively. He also tested the system out at Aaron's, another rent-to-own store. Aaron's offers 12 and 24-month plans for both consoles along with a few other variations such as a pricier "PLUS" service. The two year plans are cheaper in the short term, costing around $80 a month, but end up costing upwards of $2,000 when spread across a full 24 months. The 12-month plan comes out to $1,692 for either console. For a point of comparison: brand new PlayStation 4 or Xbox One consoles are available at many major retailers for $400 and $500 respectively. That's a bit more money to pay up front. But if Cockerman's tests are any indication, buying one outright will save you a lot of money in the long run. Like trade-in deals, it's always a good idea to put any sort of rental scheme to the test before giving anyone your credit card number.